Hyderabad August 2016: The Golkonda Hotel is proud to announce 'Sizzle in the Drizzle', a Sizzler festival at their 24-hour coffee shop, Mélange. After the tremendous response received last year, diners can once again enjoy a variety of sizzling delicacies. Take in the receding monsoon while reveling in the aromas of more than 15 unique dishes! Get ready to be enthralled with some Asian, Continen-tal, and Indian Sizzlers that come in both a vegetarian as well as a non-vegetarian option. 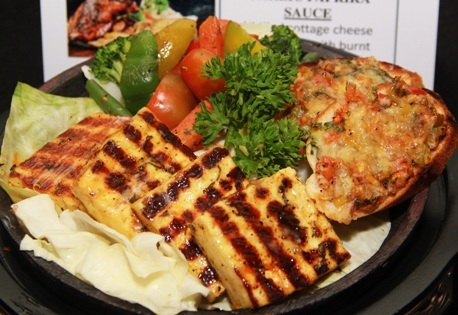 This two week festival starts on the 12th and ends on the 21st of August where one can order their fa-vourite Sizzler anytime from 11 am to 11 pm. Try the Kasundi Jheenga (Mustard spiced prawns cooked over charcoal), the Ginger Lemongrass Fish (Sliced fish tossed with ginger juliennes and lemongrass), the Roast Lamb(Carved leg of lamb cooked in a rich wine sauce), or the Roast Chicken Forestire (Griddlecooked chicken glazed with a young tomato and pepper sauce) in the non-vegetarian options. Amongst the veggie-friendly offerings take your pick from the Paneer Tulsi Tikka (Wild basil fla-voured chunks of paneer), the Little Feast (Five-spice vegetables, penne tomato basil, and exot-ic vegetable croquettes), or the Chowk ki Tikki (Spiced potato patties topped with a tamarindchutney). Accompaniments for each differs where Indian Sizzlers come with Dal Makhani and Naan, Continental come with Bruschetta, and Oriental come with Fried Rice or Noodles.